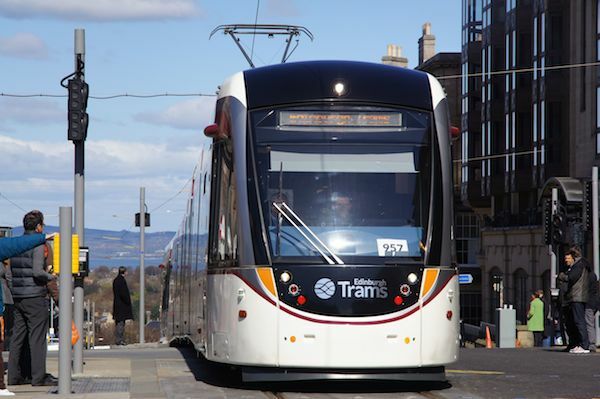 Trams are still being tested on the route which runs between Edinburgh Airport and York Place, and there is no announcement from the council as yet about the date when passengers can start using the new transport. The Edinburgh Reporter was out at Haymarket yesterday morning and made this little film which shows that pedestrians and other road users have a way to go when it comes to acknowledging the trams on the streets. All drivers have to have 60 hours of driving under their belts, and they have to do at least one practice tow of a ‘broken down’ tram before they will be allowed to carry passengers. Until then the Edinburgh public is urged to watch out for the tram. They do have bells but are otherwise silent, so pedestrians and other road users should be #carefulnow as all the social media safety messages advise. When referring to Edinburgh Trams progress, you recently used the caption “almost there”. May I respectfully invite you to visit Edinburgh Airport tram terminus and see if you would repeat that headline ! A glorified building site is to polite. A May start ? I don’t think so. I have visited Edinburgh a few times whilst the tram has been under construction, and despite problems, they are a reassuring site that public transport can be efficient and clean. A visit to many other cities in Europe would also reassure folk that the tram is a real asset in shifting crowds quickly.